Known as the “Toughest Sled Dog Race in the World,” the annual Yukon Quest Sled Dog Race annually covers over 1,000 miles between the Yukon and Alaska. Alternating starting and finish lines between Whitehorse, Yukon Territory and Fairbanks, Alaska, this sled dog race is not for the faint of heart! The terrain is some of the most difficult on the planet and the demanding trail constantly keeps sled dogs and their mushers on their toes as potential disasters wait around every turn. This race takes place each February, with the date exact date wavering depending on the weather conditions of the brutal Yukon winter. The trail for the Yukon Quest Sled Dog Race is as historic as the sport itself. Originally part of the original Gold Rush trail and the Mail Delivery trails dating back to the turn of the Twentieth Century, the trail is steeped in lore. Most of this trail cuts through untouched wilderness, thought to be some of the last on the entire continent. Lasting approximately two weeks, the mushers enter the race with his or her 14 dog sled team, striving to reach Fairbanks first. The field is diverse and features entries from all over the world, but all the entries have one thing in common—they came to win! If you find yourself in the great state of Alaska or in the beautiful territory of the Yukon this February, do not miss an opportunity to attend the Yukon Quest Sled Dog Race! Individuals of all ages are sure to enjoy this unique experience and will remember seeing the running dogs, hearing the crunch of snow, and feeling the overall air of excitement for years to come. Whether you send off the competitors in the tiny town of Whitehorse in Canada’s Yukon territory or welcome the heroic mushers and sled dogs into lovely downtown Fairbanks, Alaska, there are many opportunities to see this race. Many of the race’s checkpoints are accessible by major roadways, allowing visitors from all corners of the globe to experience this race first hand. Discover what goes on behind the scenes at a major dog sled race. This race requires a whole crew of individuals to work diligently while the competitors fly over snow banks. From veterinarians to care for the sled dogs to doctors to care for the mushers to talented chefs to provide all competitors—both animal and human—with quality food, it truly takes a village for the event to get off the ground. 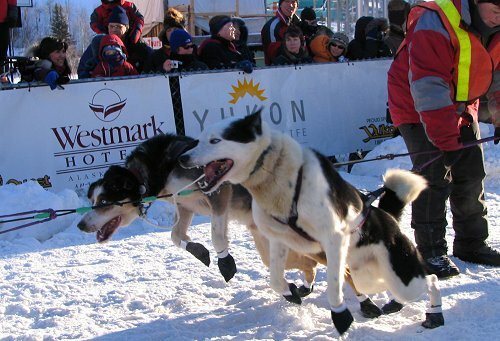 Make a trip to Alaska to experience the nonstop action and excitement of the Yukon Quest Sled Dog Race! Bring the entire family to cheer on all the competitors and watch as one talented musher and his (or her!) sled dog team crosses into Fairbanks first to be declared victorious!